Planning a winter party? Well, let it snow! Snow makes a great decorating motif because it combines pure colors with glamorous metallics. Decorating options can vary from the traditional to the contemporary. To decorate a spectacular winter party table, first choose a silver, white, or blue tablecloth then add sparkles, sequins, and glitter of all kinds. Here are several gorgeous winter party tables covered with sparky tablecloths that evoke the feel of winter landscapes. Whether you’re planning a winter wedding, a shower, or a birthday party, let these winter party tablecloth ideas inspire you. How do you like this Cookie Table from Hub Pages? I live just north of Pittsburgh, so cookie tables at wedding receptions is nothing new to me, although this spectacular cookie table complete with LED lights is the most impressive one I’ve ever seen! Disney’s Frozen is wildly popular with the pre-teen crowd, so I wasn’t surprised to find several Frozen-themed birthday party ideas online. 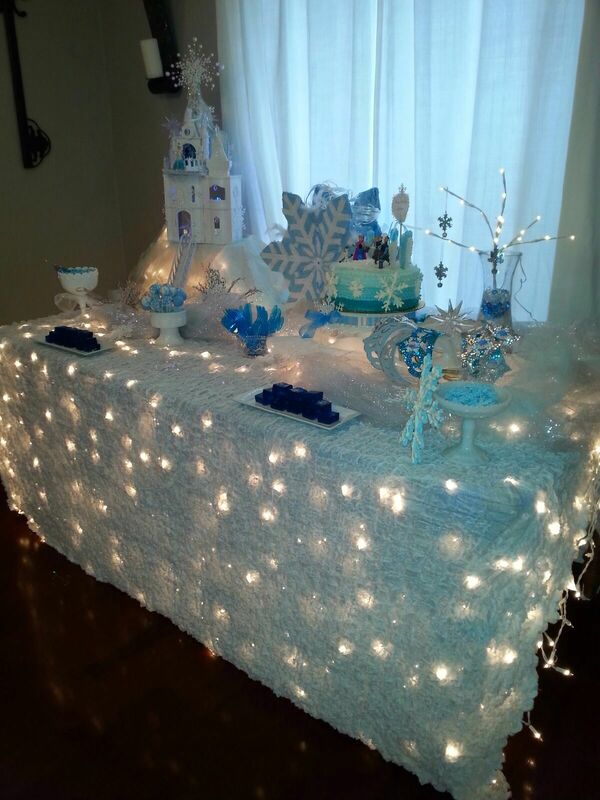 Here’s a pretty table from Kara’s Party Ideas that uses ruffles and crepe paper to simulate a winter landscape. This gorgeous wedding reception room decorated by Linen Effects has so many beautiful winter-themed elements that I don’t know where to start! The ice blue ruffled chair covers sure make a statement, don’t they? The Perfect Palette always has fabulous wedding photographs. I especially like this sparkling silver tablecloth that cascades and pools on the floor. Taylor Made Soirees has several photos of this wedding party featuring “sparkle, shimmer, shine, and sequins.” The silver tablecloths look glorious, especially when combined with silver chairs. First, our Sequins tablecloths come in eight great colors. The silver on white would be perfect for a winter party table. 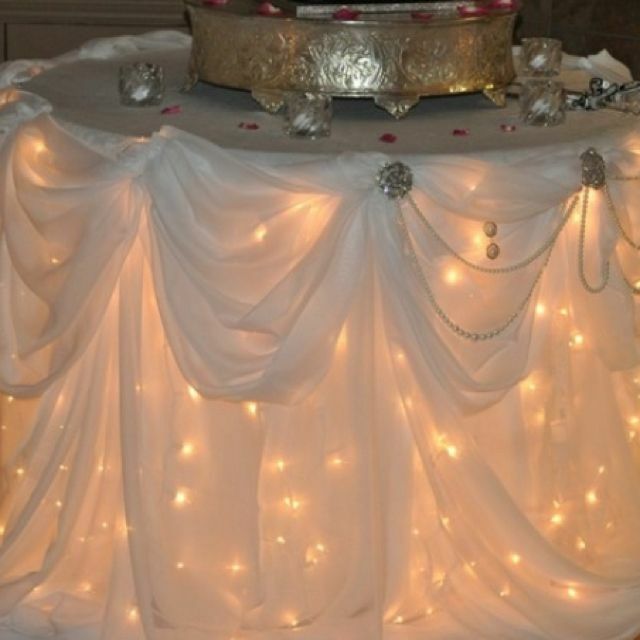 One of our most popular glitzy tablecloths is made with Sparkle Organza. These table coverings are used as tablecloth overlays to accentuate colors and add sparkle. If you’re looking for a light-weight table cover, check out our gorgeous Tissue Lame tablecloths in 13 beautiful colors. Here’s a snazzy tablecloth called Ceylon. It combines sheer fabric with metallic thread highlights. Our newest line of tablecloths, Supernova Shantung, is an elegant faux silk fabric that comes in 27 luxurious colors. I hope you liked these winter party tablecloth ideas. No matter what kind of winter party you’re hosting, make life easier on yourself by starting with a glitzy tablecloth from Bright Settings. If you’d like free swatches of any of our tablecloth fabrics, order them online or call 1-800-327-6025 during regular business hours. Just pay $1.95 for postage. The fabric sample program takes the guesswork out of table decorating so you can enjoy planning your winter party.